Size Choose Size M/L upto 42"XL Up To 46"XXL Up to 52"
Who was Jesus? Jesus has been a major religious figure for the past 2012 years and it is from the story of Jesus that we now mark the years passing. 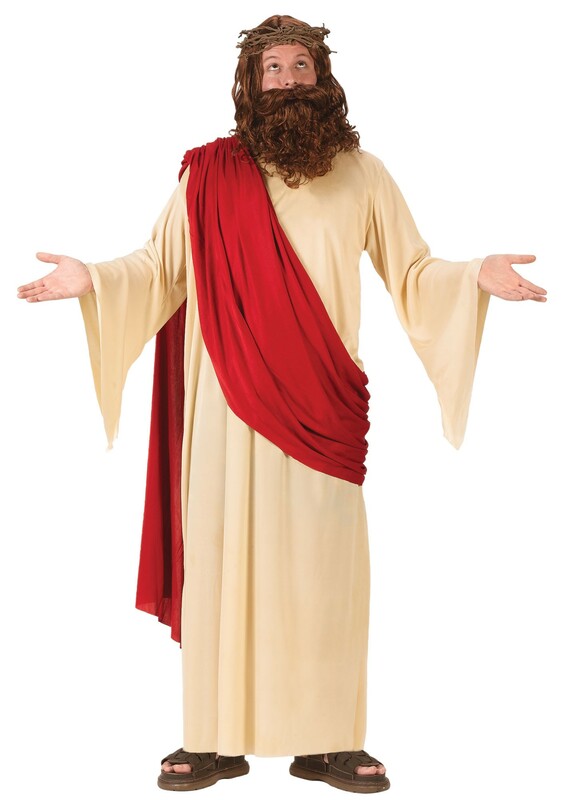 Look like the doomed saviour in this Men's Jesus Christ Fancy Dress Costume. The Jesus costume has everything you need to turn your into the Christian Saviour. Features a long cream robe with a bright red drape that sits over the shoulder and a great looking brown curly wig and beard set with attached thorny crown. Perfect for any religious occasions where you need to dress up as the son of God!